The Dakota Access Pipeline (DAPL) is expected to get the final federal permit it needs — an easement to tunnel under the Missouri River — within days, according to the office of U.S. Sen. John Hoeven, R-ND, and news reports coming out of the state. Expect this move to trigger lawsuits and more protests around the country. The federal government already is bringing in more law enforcement to the state in anticipation of renewed protests at the construction site. One of the immediate questions is whether renewed work on the pipeline will trigger more opposition at the site, and even more violent clashes. According to Hoeven’s statement, a number of federal agencies, including Homeland Security, are working to secure more resources to help state and local law enforcement. That includes the recent arrival of 20 additional Bureau of Indian Affairs law enforcement officers at Standing Rock. The Standing Rock Sioux Tribal Council has asked the protesters to leave Corps land, according to Hoeven’s statement. However, there is no guarantee people will follow the directive. Further, Hoeven’s office said an environmental impact statement (EIS) is not likely to take place. That statement will trigger a great deal of confusion. The Army Corps of Engineers already has started an EIS for the project, something authorized during the very end of the Obama administration. If the federal government short circuits that process and gives immediate approval for the DAPL easement, expect lawsuits to follow quickly. The questions will be whether the courts will require the current EIS to continue — and whether they will approve a temporary injunction on the tunneling work. 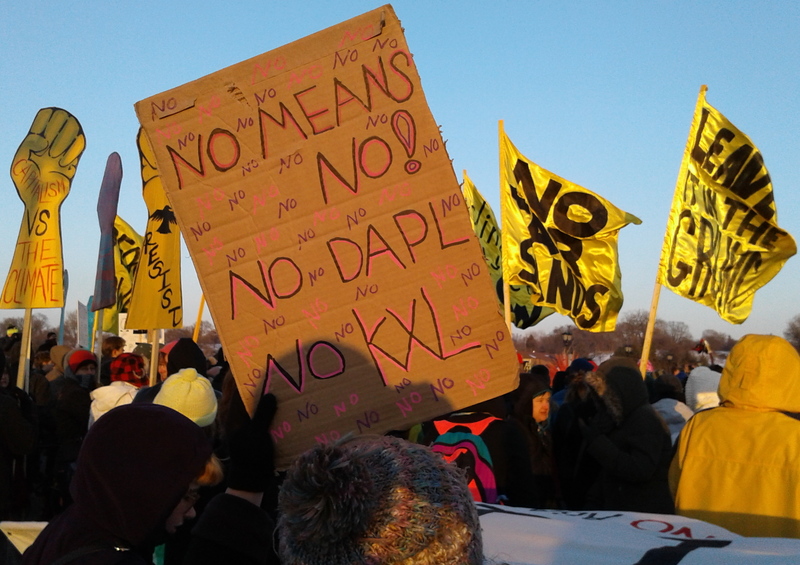 We were alerted to this article by a Facebook post from “No Dakota Access Pipeline Global Solidarity Campaign.” It included information on a Standing Rock Update webinar, Wednesday, Feb. 1, starting at 7 p.m. Central Time. Register here. Today, Senator John Hoeven issued a statement declaring that the Acting Assistant Secretary of the Army had directed the Army Corps to proceed with the final easement necessary to complete the proposed route of the Dakota Access Pipeline. While this news is disappointing, it is unfortunately not surprising. It is also not a formal issuance of the easement—it is notification that the easement is imminent. The Corps still must take into consideration the various factors mentioned in the Presidential Memorandum, notify Congress, and actually grant the easement. If and when the easement is granted, the Standing Rock Sioux Tribe will vigorously pursue legal action. We have to this date received no formal notice that the EIS has been suspended or withdrawn. To abandon the EIS would amount to a wholly unexplained and arbitrary change based on the President’s personal views and, potentially, personal investments. Furthermore, the Army Corps lacks statutory authority to simply stop the preparation of the EIS and issue the easement. We stand ready to fight this battle against corporate interest superseding government procedure and the health and wellbeing of millions of Americans.